My toddler boy, Smarty Pants, devours cucumber rolls. He loves them. He scarfs down a dozen in about 10 minutes. It is amazing to watch. He chants “Sushi, Sushi!” before he starts his feast, and doesn’t stop until the last bit of sticky rice is cleared from his plate and safe on its way to his tummy. Getting sushi for dinner has become a near weekly ritual for Smarty Pants and I, and I enjoy it a lot. We walk to the sushi place together, and he is excited the whole way there. Today was no different, except I wanted to have some fun with him along the way. Um. Wait a second. 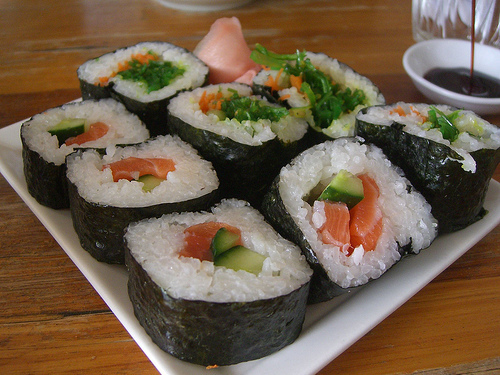 Rice and cucumber wrapped in seaweed IS sushi. It is a cucumber roll in fact. His favorite type of sushi. My little Kappamaki (河童巻き) experiment worked. I was actually trying to prove that the words we use, and how we frame them into sentences, can make all the difference in the world when talking to our kids. Young kids, like my toddler Smarty Pants, don’t yet share the same expansive vocabulary that we do, and don’t always look at things the same way that we do. If you have a child, I am sure this is obvious to you. Sushi is either sushi or a cucumber roll. It is not cucumber with rice wrapped in seaweed. What is seaweed? This is very important to remember when we talk to our kids. Sometimes we think our kids aren’t listening, but sometimes they just don’t understand what we are asking of them. Frame your request slightly differently, and you’re no longer speaking Greek. Bada bing. Bada boom. Aha. This applies to food and mealtimes in a slightly related and unrelated way. The exact same food might be heartily devoured, or shunned in disgust, depending on how it is presented. Smarty Pants likes cheddar cheese, but sometimes he only eats it if it is grated. He might not eat certain vegetables if they are just served whole on a plate, but if they are made into a vegetable patty they stand a chance at being consumed. You probably have a lot of examples of your own too. So, next time you find yourself frustrated that your child is “not listening” or not eating, just think of sushi. Try to change your approach, your wording, or your presentation, and you might just get what you were after. And if not, go for a beer and try again later. Flickr photo courtesy of avlxyz. A nice post, communication with kids is very important. How we do also does matter. It has to be done is such a way they can understand easily. Sometimes we need to step into their shoes. As said by Stephen Covey little bit differentiation is necessary. @Kelly, thanks for the comment, good point about trying to put ourselves in our kid’s shoes when communicating with them. That is key. Hmm…that was fun to read. A very good post about communicating with your kid. Thanks for posting. That dish looks extremely delicious btw. @Hand Me Downs – thanks, glad you liked the post and the pic! I just learned that we need to listen to our kids from time to time. Thanks for this post, its awakening for moms.